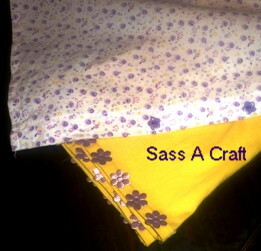 Flowered Pants | Sass a Craft - Muslim Women are Smart & Crafty Too! The little one is getting taller and taller everyday. Some of her pants have become “high-waters,” yet they still fit otherwise. It’s still hot out, so I decided to sass them into a pair of faux Culottes. I’m not going to write out a long tut, however, this is what I did in a nutshell. Her refurb’d duds matched perfectly with an old sun dress that has gotten too short. She now wears it as a shirt (ha ha ha). Cuteness.